サービスとしての Windows は、Windows 10 デバイスを更新する手法です。Windows as a Service is the way to update Windows 10 devices. Windows 10 のすべての新しい機能更新プログラムと品質更新プログラムには、以前の更新プログラムの内容がすべて含まれています。With Windows 10, new Feature Updates and Quality Updates include the contents of all previous updates. 最新の更新プログラムをインストールしている限り、Windows 10 デバイスが最新の状態であることを把握できます。As long as you've installed the latest update, you know your Windows 10 devices are up-to-date. 以前のバージョンの Windows とは異なり、更新プログラムの一部ではなく全体をインストールすることが必要になります。Unlike with previous versions of Windows, you now must install the entire update instead of part of an update. 利用可能なサービス チャネルの詳細については、「サービスとしての Windows の概要」を参照してください。For details on the available servicing channels, see Overview for Windows as a Service. 遅延設定:デバイスのグループに対して更新プログラムのインストールを遅らせるように更新遅延設定を構成します。Deferral Settings: Configure update deferral settings to delay update installations for groups of devices. これらの設定を使用して、更新プログラムを段階的にロールアウトし、その過程を確認できるようにします。Use these settings to stage your update roll-out so you can review progress along the way. 一時停止:更新プログラムのロールアウトで問題がある場合、更新プログラムのインストールを延期できます。Pausing: If there's an issue during the update rollout, you can postpone the update installation. メンテナンス期間:更新プログラムをインストールできる時間を構成します。Maintenance window: Configure the hours in which updates can be installed. 更新プログラムの種類:インストールされる更新プログラムの種類を選択しますUpdate type: Choose the types of updates that get installed. (品質更新プログラム、機能更新プログラム、ドライバーなど)。For example, Quality Updates, Feature Updates, or drivers. インストールの動作:更新プログラムがインストールされる方法を構成します。Installation behavior: Configures how the update gets installed. (インストール後にデバイスを自動的に再起動するかなど)。For example, does the device automatically restart after the installation? ピアのダウンロード:ピアのダウンロードを構成するように選択できます。Peer downloading: You choose to configure peer downloading. 構成した場合、デバイスで更新プログラムのダウンロードが完了すると、他のデバイスがそのデバイスからの更新プログラムをダウンロードできるようになります。If configured, when a device has finished downloading an update, other devices can download the update from that device. この設定により、ダウンロード処理を高速化できます。This setting speeds up the download process. 更新プログラム リングを作成したら、これらをデバイスのグループに割り当てます。After you create update rings, you assign them to groups of devices. 更新プログラム リングを使用すると、自社のビジネス ニーズを反映した更新プログラム戦略を立てることができます。By using update rings, you can create an update strategy that mirrors your business needs. 詳しくは、「Windows Update for Business を使った更新プログラムの管理」をご覧ください。For more information, see Manage updates using Windows Update for Business. Windows 10 PC を更新するには、Windows Anniversary Update 付き Windows 10 Pro 以降を実行している必要があります。To update Windows 10 PCs, they must be running at least Windows 10 Pro with the Windows Anniversary update. Windows 10 Mobile を実行するデバイスはサポートされていません。Devices running Windows 10 Mobile aren't supported. Windows デバイスで、[フィードバックと診断] > [診断と使用状況データ] が基本以上に設定されている必要があります。On Windows devices, Feedback & diagnostics > Diagnostic and usage data must be set to at least Basic. この設定は手動で構成することも、Windows 10 以降用の Intune プロファイルを使用することもできます ([デバイスの制限] > [レポートとテレメトリ] > [使用状況データの共有] を [基本] に設定)。You can configure this setting manually, or use an Intune profile for Windows 10 and later (Device restrictions > Reporting and Telemetry > Set Share usage data to at least Basic). デバイスのプロファイルの詳細については、「Microsoft Intune でデバイスの制限設定を構成する方法」をご覧ください。For more information about device profiles, see configure device restriction settings. 必要な設定を使用して、Azure ポータルで Windows 10 更新プログラム リングを作成します。Create Windows 10 update rings in the Azure portal with the settings that you need. Azure portal では [プレリリース機能を許可する] 設定はサポートされていません。これは、最新の Windows 10 ビルドに該当しなくなったためです。The Allow pre-release features setting isn't supported in the Azure portal because it's no longer applicable to the latest Windows 10 builds. 更新プログラム リングを作成するとき、他の設定と他の Windows 10 更新プログラムの設定を構成できます。You can configure the other settings, and other Windows 10 updates settings, when you create update rings. 従来のポータルで作成した Windows 10 更新プログラム設定は、移行後、Azure Portal に表示されません。Windows 10 updates settings created in the classic portal are not displayed in the Azure portal after migration. ただし、これらの設定は適用されます。However, these settings are applied. これらのいずれかの設定を移行し、Azure Portal から移行されたポリシーを編集した場合、これらの設定はポリシーから削除されます。If you migrate any of these settings, and edit the migrated policy from the Azure portal, these settings are removed from the policy. 従来のポータルで更新プログラムの設定を削除します。Delete the update settings in the classic portal. Azure portal に移行し、同じ設定を更新プログラム リングに追加した後、クラシック ポータルの設定を削除して潜在的なポリシーの競合を回避する必要があります。After you migrate to the Azure portal, and add the same settings to an update ring, delete the settings in the classic portal to avoid any potential policy conflicts. たとえば、同じ設定を異なる値で構成した場合、競合は発生しません。For example, when the same setting is configured with different values, there is a conflict. クラシック ポータルで構成した設定は Azure portal に表示されないため、簡単に把握することができません。There isn't an easy way to know because the setting configured in the classic portal isn't in the Azure portal. Azure portal で、[すべてのサービス] を選択し、Intune でフィルター処理して、Microsoft Intune を選びます。In the Azure portal, select All services, filter on Intune, and then select Microsoft Intune. [ソフトウェア更新プログラム] > [Windows 10 更新プログラムのリング] > [作成] の順に選択します。Select Software updates > Windows 10 Update Rings > Create. 名前、説明 (省略可能) を入力し、[構成] を選択します。Enter a name, a description (optional), and then choose Configure. サービス チャネル:デバイスが Windows 更新プログラムを受信するチャネルを設定します。Servicing channel: Set the channel from which the device receives Windows updates. Microsoft 製品の更新プログラム:Microsoft Update のアプリの更新プログラムをスキャンするように選択します。Microsoft product updates: Choose to scan for app updates from Microsoft Update. Windows ドライバー:更新プログラムから Windows Update ドライバーを除外するように選択します。Windows drivers: Choose to exclude Windows Update drivers during updates. 品質更新プログラムの遅延期間 (日数):品質更新プログラムを遅延させる日数を指定します。Quality update deferral period (days): Enter the number of days for which quality updates are deferred. これらの品質更新プログラムの受信を、リリースから最大 30 日間延期できます。You can defer receiving these Quality Updates up to 30 days from their release. 品質更新プログラムは、既存の Windows 機能の修正プログラムや機能強化で、月の第 2 火曜日に公開されるのが一般的です。Quality Updates are typically fixes and improvements to existing Windows functionality, and are published the second Tuesday of every month. これらの更新プログラムは、Windows Update for Business を介した品質更新プログラムでは、受信のみされます ('B' リリース)。一方、その他の更新プログラムは、いつでも Microsoft からリリースできる場合があります。Quality Updates through Windows Update for Business only receive these updates (the 'B' release), although other updates may be released at any time by Microsoft. Windows Update 上で品質更新プログラムが入手できるようになってから、その受信を延期するかどうか、どれくらい延期するかを定義できます。You can define if, and how long, you defer receiving Quality Updates after they're available on Windows Update. 詳細については、「Windows Update for Business を使った更新プログラムの展開」を参照してください。For more information, see Deploy updates using Windows Update for Business. 機能更新プログラムの遅延期間 (日数):機能更新プログラムを遅延させる日数を入力します。Feature update deferral period (days): Enter the number of days for which Feature Updates are deferred. 機能更新プログラムの受信を、リリースから最大 180 日間延期できます。You can defer receiving Feature Updates up to 180 days from their release. 機能更新プログラムは、通常、Windows の新しい機能です。Feature Updates are typically new features for Windows. [サービス チャネル] 設定を構成したら、Windows Update 上で機能更新プログラムが入手できるようになってから、その受信を延期するかどうか、どれくらい延期するかを定義できます。After you configure the Servicing channel setting, you can define if, and how long, you defer receiving Feature Updates after they're available on Windows Update. 次に例を示します。サービス チャネルが半期チャネル (対象指定) に設定され、遅延期間が 30 日の場合:機能更新プログラム X が Windows Update で 1 月に半期チャネル (対象指定) として最初に公開されるものとします。For example: If the Servicing channel is set to Semi-Annual Channel (Targeted), and the deferral period is 30 days: Let's say that Feature Update X is first publicly available on Windows Update as a Semi-Annual Channel (Targeted) in January. デバイスは 2 月になるまで (30 日後まで) 更新プログラムを受信しません。The device doesn't receive the update until February - 30 days later. サービス チャネルが半期チャネルに設定され、遅延期間が 30 日の場合:機能更新プログラム X が Windows Update で 1 月に半期チャネル (対象指定) として最初に公開されるものとします。If the Servicing channel is set to Semi-Annual Channel, and the deferral period is 30 days: Let's say the Feature Update X is first publicly available on Windows Update as a Semi-Annual Channel (Targeted) in January. 4 か月後の 4 月に、機能更新プログラム X が半期チャネルにリリースされます。Four months later, in April, Feature Update X is released to Semi-Annual Channel. デバイスは、この半期チャネル リリースの 30 日後に機能更新プログラムを受信し、5 月に更新されます。The device receives the Feature Update 30 days following this Semi-Annual Channel release, and updates in May. 自動更新の動作:再開または再起動するときに自動更新プログラムをインストールする方法を選択します。Automatic update behavior: Choose how automatic updates are installed, when to restart or reboot. 詳しくは、「Update/AllowAutoUpdate」をご覧ください。For details, see Update/AllowAutoUpdate. [既定にリセット] の設定では、2018 年 10 月更新以降を実行している Windows 10 コンピューター上で元の自動更新設定を復元します。A setting of Reset to default will restore the original auto update settings on Windows 10 machines that run the October 2018 Update or later. 自動動作の頻度:更新プログラムの動作として [Auto install and restart at scheduled time](スケジュールされた時刻に自動的にインストールして再起動する) を選択した場合に、この設定が表示されます。Automatic behavior frequency: If you select Auto install and restart at scheduled time for the update behavior, then this setting is shown. この設定を使用して、週、日、時刻など、更新プログラムをインストールするタイミングをスケジュールします。Use this setting to schedule when updates are installed, including the week, the day, and the time. 再起動チェック:既定で有効になります。Restart checks: Enabled by default. デバイスの再起動時には、アクティブなユーザー、バッテリ レベル、実行中のゲームなどについて、いくつかのチェックが実行されます。When you restart a device, there are some checks that occur, including checking for active users, battery levels, running games, and more. デバイスの再起動時にこれらのチェックをスキップするには、[スキップ] を選択します。To skip these checks when you restart a device, select Skip. Block user from pausing Windows updates (ユーザーによる Windows 更新プログラムの一時停止をブロックする):既定で有効になっています。Block user from pausing Windows updates: Allowed by default. この設定を使用すると、コンピューターの "設定" から、ユーザーによる更新プログラムのインストールの一時停止を許可またはブロックできます。Use this setting to block or allow your users to pause update installation from the Settings of their machines. 配信の最適化ダウンロード モード:配信の最適化は、ソフトウェアの更新プログラムで Windows 10 更新リングの一部として構成されなくなりました。Delivery optimization download mode: Delivery optimization is no longer configured as part of a Windows 10 Update Ring under Software Updates. 現在、配信の最適化はデバイスの構成で設定されます。Delivery optimization is now set through device configuration. ただし、以前の構成は引き続きコンソールで使用できます。However, previous configurations remain available in the console. これらの以前の構成は、[未構成] へと編集することで削除できますが、それ以外の変更を行うことはできません。You can remove these previous configurations by editing them to be Not configured, but they cannot otherwise be modified. 新しいポリシーと既存のポリシーの間の競合を避けるには、既存の更新リングから配信の最適化へ移動する方法に関するページを参照し、設定を配信の最適化プロファイルに移動します。To avoid conflicts between new and old policy, see Move from existing update rings to delivery optimization and then move your settings to a Delivery optimization profile. 終了したら、[OK] を選択します。When done, select OK. [更新プログラムのリングの作成] で、[作成] を選択します。In Create Update Ring, select Create. 新しい更新プログラム リングが、更新プログラム リングの一覧に表示されます。The new update ring is displayed in the list of update rings. リングを割り当てるには、更新プログラム リングの一覧でリングを選択し、[<リング名>] タブで [割り当て] を選択します。To assign the ring, in the list of update rings, select a ring, and then on the <ring name> tab, choose Assignments. 次のタブで、[含めるグループを選択] を選択してから、このリングを割り当てるグループを選択します。On the next tab, choose Select groups to include, and then choose the groups to which you want to assign this ring. 選択が完了したら、[選択] を選んで割り当てを完了します。When finished, choose Select to complete the assignment. 更新プログラムのコンプライアンス対応は、Intune で、または Update Compliance という無料ソリューションを使用して表示することができます。You can view update compliance in Intune or by using a free solution called Update Compliance. ポリシー レポートを確認して、構成した Windows 10 更新プログラム リングの展開状態を表示します。 Review a policy report to view the deployment status for the Windows 10 update rings that you have configured. [ソフトウェア更新プログラム] > [概要] の順に選択します。Select Software updates > Overview. 割り当てたすべての更新プログラム リングの状態に関する一般的な情報を表示することができます。You can see general information about the status of any update rings you assigned. [監視] セクションで、[更新プログラムごとのリングの展開の状態] を選択します。In the Monitor section, choose Per update ring deployment state. [ソフトウェア更新プログラム] > [Windows 10 更新プログラムのリング] で、確認する展開リングを選択します。In Software updates > Windows 10 Update Rings, choose the deployment ring to review. Windows 10 更新プログラム ロールアウトを監視するには、Update Compliance と呼ばれる無料のソリューションを使用します。You can monitor Windows 10 update rollouts by using a free solution called Update Compliance. 詳しくは、「Monitor Windows Updates with Update Compliance (更新プログラムのコンプライアンス対応を使用した Windows Update の監視)」をご覧ください。For details, see Monitor Windows Updates with Update Compliance. このソリューションを使用すると、更新プログラムのコンプライアンス対応を報告する Intune の対象管理の任意の Windows 10 デバイスに商用 ID を展開できます。When you use this solution, you can deploy a commercial ID to any of your Intune managed Windows 10 devices for which you want to report update compliance. 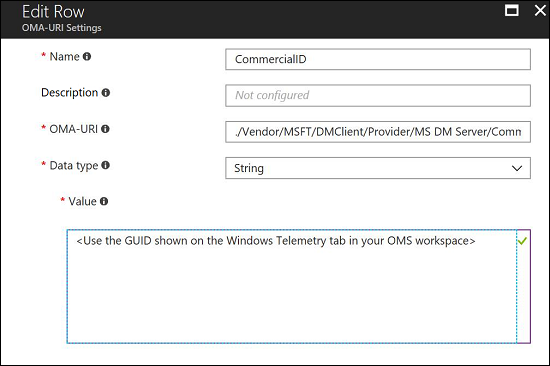 Intune で、カスタム ポリシーの OMA-URI 設定を使用して商用 ID を構成できます。In Intune, you can use the OMA-URI settings of a custom policy to configure the commercial ID. 詳しくは、「Microsoft Intune での Windows 10 デバイス向けの Intune ポリシー設定」を参照してください。For details, see Intune policy settings for Windows 10 devices in Microsoft Intune. MS DM サーバーに関する詳細については、「DMClient 構成サービス プロバイダー (CSP)」を参照してください。For more information about MS DM Server, see DMClient configuration service provider (CSP). 更新プログラムを一時停止したときから最大 35 日間、機能更新プログラムまたは品質更新プログラムのデバイスでの受け取りを一時停止することができます。You can pause a device from receiving Feature Updates or Quality Updates for a period of up to 35 days from the time you pause the updates. 最大日数が経過すると、一時停止機能の有効期限が自動的に切れ、デバイスによる Windows Update の該当する更新プログラムのスキャンが開始されます。After the maximum days have passed, pause functionality automatically expires and the device scans Windows Updates for applicable updates. このスキャン後に、もう一度更新プログラムを一時停止することもできます。Following this scan, you can pause the updates again. [ソフトウェア更新プログラム] > [Windows 10 更新プログラムのリング] の順に選択します。Select Software updates > Windows 10 Update Rings. 更新プログラム リングの一覧で、一時停止するリングを選択し、一時停止する更新プログラムの種類に応じて、[...] > [品質更新プログラムの一時停止] または [機能更新プログラムの一時停止] を選択します。In the list of update rings, choose the ring you want to pause, and then, choose ... > Pause Quality > or Pause Feature, depending on the type of updates you want to pause. 一時停止コマンドを発行した場合、デバイスは、次にサービスにチェックインしたときにこのコマンドを受信します。When you issue a pause command, devices receive this command the next time they check into the service. チェックインする前に、スケジュールされた更新プログラムをインストールする可能性もあります。It's possible that before they check in, they might install a scheduled update. また、一時停止コマンドを発行したときに対象のデバイスが無効になっていると、有効にしたときに、デバイスは Intune でチェックインする前に、スケジュールされた更新プログラムをダウンロードしインストールする場合があります。Additionally, if a targeted device is turned off when you issue the pause command, when you turn it on, it might download and install scheduled updates before it checks in with Intune. Intune で、[ソフトウェア更新プログラム] を選択します。In Intune, select Software updates. [Windows 10 更新リング]、既存の更新リング、[アンインストール] の順に選択します。Select Windows 10 Update Rings > select an existing update ring > Uninstall. Windows 10 マシンで品質更新プログラムが正常にロールバックされた後も、エンドユーザーは [Windows の設定] > [更新プログラム] > [更新履歴] の順に選択して更新プログラムを確認できます。On Windows 10 machines, after the quality update is successfully rolled back, end-users continue to see the update listed in Windows settings > Updates > Update History.